35 young people from every part of Italy joined the CARP workshop held in Colle Mattia (Rome) from the 22nd to the 25th of April. It was a great chance for us to share about what we’ve accomplished so far as a youth association. This was a good place to make a new start and determine to make a positive impact in society. The motto of the workshop “Life of Values and Pure Relationships for a Better Society” was the underlying theme of each activity: lectures, discussions, service projects and leisure activities. These activities created a warm spirit and good space for developing stronger bonds between the participants. The lectures, given mainly by young life coaches, covered different topics such as the importance of character education and family values, the fundamental essence of human life and leadership guidance. After each lecture, we had engaging discussions on how we can apply the content to our personal lives. Participants took part in two service projects. One group cleaned up the area around the Colle Mattia train station by picking up all the garbage lying around. 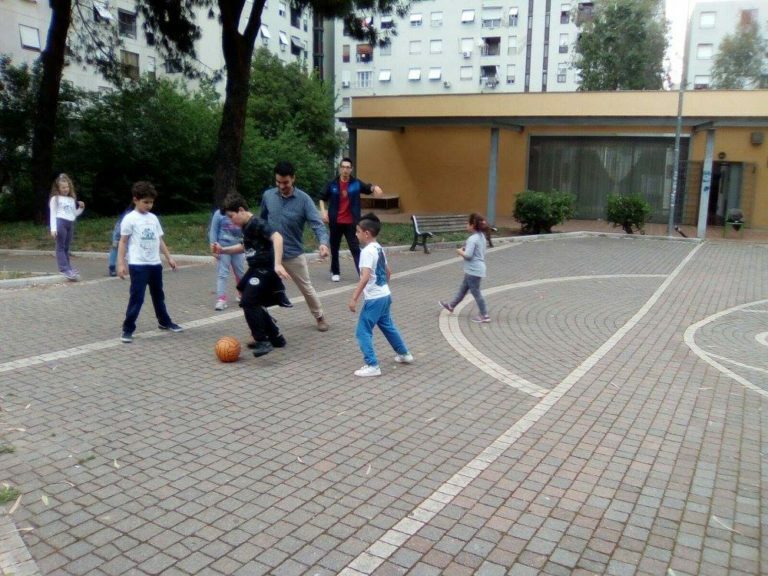 The other group helped staff an event organised by the local community of Sant’Egidio to spread love and joy to children through games, cooking, dancing and other fun activities. Through these service projects, participants got a chance to live for the sake of others and invest their love and energy for the greater good of the society. They were small projects but they had a significant impact on the local communities. Afterwards, we visited a special art museum called “Living Together” which was created by disabled artists who kept investing in their passion and talents despite their disabilities. We were inspired to see the beautiful artwork created by these artists. The next day’s theme was “Pure Relationships” so we had lectures on purity and relationships followed by discussions about various interesting topics; “How to prepare yourself before committing to a relationship”, “the differences in the expression of love between man and woman”, “how to grow together as a couple”, “what to consider when starting a family” and “how to pass on our values and traditions to our kids”. We also took part in leisure activities such as sports, dance, board games and karaoke. The day ended with an evening program dedicated to reflection and meditation. On the last day, it was time to try to come up with an answer to the question, “How we can build a better society and where do we start?” To give us some inspiration, we had lectures by Elena Chirulli and Fiorella Capone on topics such as “Discovering Ourselves”, “Our Identity” and “Strengths and Abilities.” Emphasis was placed on the importance of having clear goals in life that are not just focused on the individual self but on the wider society. Participants found this exercise to be very useful and many were proud to share it with others. Some discovered that they do have a “personal mission” deep down inside and having the chance to write it down made it more concrete and clear. Now they can start to create an action plan with steps in order to achieve it. They then brainstormed ideas about future CARP events and activities in each community as well as on a national level. Some of the outcomes of these sessions were the establishment of three committees: the media committee (you tube channel coming soon! ), the writers’ committee and CARP Italy Facebook Page Administrators’ committee. The participants showed a strong desire to cooperate, take initiative and take responsibility. We all felt that this workshop was a great success in motivating and energizing the Italian youth movement and we now look forward to working together with clarity, passion and determination!